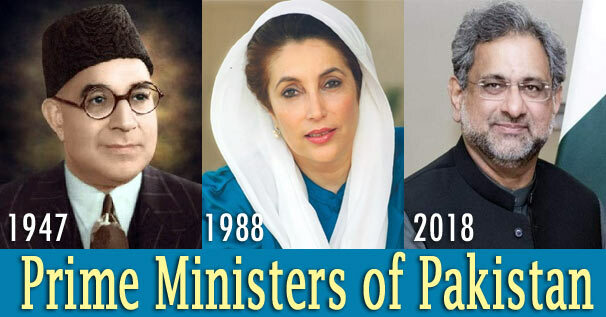 Prime Ministers of Pakistan is the main and an important part of international general knowledge. On which the questions like ‘first prime minister of Pakistan’ ‘current prime minister of Pakistan’ ‘prime minister of Pakistan female’ ‘three times Pakistan prime minister’ etc are being asked. All the questions are also very useful and important for the examinations conducted by the others state governments and central government. Therefore, Here we are giving brief examination material on the Prime Ministers of Pakistan. So that you can save your time and can learn easily. On the topic of Prime Ministers of Pakistan, lists are taken which are being asked frequently or there is most probably to ask these questions in upcoming examinations. When you search on Google, you find many confused and disturbing results on Prime Ministers of Pakistan, therefore, here on the Prime Ministers of Pakistan we are giving correct and exam oriented, updated material very carefully. Note: Nawaz Sharif's brother Shehbaz Sharif will be the next Prime Minister of Pakistan, but till he is not inducted at post, Shahid Khaqan Abbasi has been appointed at caretaker Prime Minister.